Jocks (and Coaches, and Industry Leaders) for Justice? We look up to athletes as role models. We want them to behave professionally, and say and do the right thing at all times, while also playing to the best of their abilities during games. The debate in today’s world that comes up is what exactly is the right thing to say or do, and if anything should be said, or done, at all. The past few months have been filled with numerous controversial stories over the actions of police officers against other people. The first came when Michael Brown was shot and killed in Ferguson, Missouri. 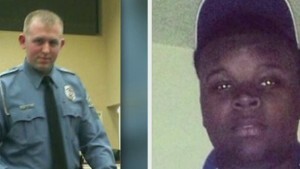 The controversy is over whether or not Darren Wilson, the officer that fired at Brown, was acting in self-defense after Brown attacked him and attempted to take his gun, or whether Brown did not actually do anything wrong, and the officer shot him in a reckless case of police brutality. The grand jury of the case chose to not indict Wilson, which sparked continuous protests in Ferguson. Are eSports Bad for Society? The 21st century is well known for its developments in technology, ranging from medicine to video games. Although most of the developments in technology are positive, there are some negative effects. One negative effect would be eSports or electronic sports. Electronic sports are a type of “sport” that deals with video game competitions between professionals. These eSports continue to draw out major sponsors, such as Coca Cola, and numerous fans. This picture was taken at the 2006 World Cup of eSports held in Paris. There were over 30,000 fans! The question of whether eSports are actual sports is up to much debate. For example, in Ben Mcgrath’s article, ESPN’s President John Skipper states that “It’s [eSports] not a sport…it’s a competition.” I would agree with him in this sense because a sport should constitute some sort of athleticism, but eSports do not. Electronic sports can range from one on one matches, such as NBA 2K15, to team matches, such as Halo. However, as I have learned through my Communications 102 class, video games have a negative effect on society. Playing video games can actually become an addiction. For example, Jordan Vinnie, from Oregon, booked a cruise and locked himself in the room solely to play video games. Gamers who play heavily have lower real world social support, and higher rates of depression, stress, and anxiety. According to the New York Times article, “For South Korea, E-Sports Is National Pastime – NYTimes.com,” eSports are a milestone in South Korea’s technological and national development. Jun Byung-hun, a South Korean National Assembly member and leader of South Korea’s eSports division, KeSPA, discusses video game addictions and how parents believe that video games are simply distracting their children from education. He states that “the best way to avoid addiction is for families to play games together.” In my opinion, his claim will be accurate in years to come. My parents did not grow up playing video games so they do not play with me. Nonetheless, because I play video games at 18 years old, I will most likely play with my children to monitor their play and develop my relationships with them, as playing video games is entertaining. Video games are also very violent. The most well known video game series is Call of Duty and it is a violent video game. This violence can cause one to become more violent in real life. Because of the phenomenal graphics nowadays, players are primed in the short term by violent game play, which creates elevated levels of aggression. Repeated priming makes these mental pathways more easily accessible and eventually these aggressive thoughts become hardwired and create more aggressive personality. Although the U.S. has implemented a law that does not allow adolescents to play rated “M” (for mature) games, children continue to find ways to play the games. The development of eSports is great for the video game industry, but bad for individuals. If video games become the new football and basketball, then humans will be less healthy and their mental states will differ for the worse. This is why I believe that eSports in the United States need to be controlled because video games are simply not as healthy as real sports and do not have the potential benefits, such as scholarships, physical activity, sport as a job, that real sports do. I do visualize more video game communities arising in the United States and I hope that this is controlled. The DOTA 2 Championship this year was broadcasted on ESPN 2 and included a grand prize of over 5 million dollars. If you are at all active online, play video games, or even just watch the news, you’ve likely heard of a new development in the world of gaming: eSports. Over the past decade, interest in games has increased greatly, and companies have formed to try and cash in on the great talent of top players. Major League Gaming, probably the most prominent of these companies, was founded all the way back in 2002 and has grown exponentially since then, as shown in the huge fan following for games like League of Legends (the 2014 World Championship was hosted in Seoul, South Korea’s World Cup stadium). But are eSports truly sport? Can we put video games in the same list as football, baseball, or soccer? Athletes’ Activism: Is it Right to Speak Out? If you live in America and haven’t been under a rock for the last five months, you’ve heard something on the news about the Michael Brown shooting in Ferguson, Missouri. Brown was an African-American teenager who was shot and killed by a white police officer. While this case has made national news stories, there have a few other similar cases, including the killing of Tamir Rice (a 12-year old kid) and Eric Garner (a grown man) by police. Many people, including professional athletes, have spoken out against these killings. Sports have been a significant aspect of this course, not only teaching us about political theory, but also inspiring us to think about their implications in society. As the semester wraps up, one can only tie up the discussion of sports by considering how competitiveness has merged with modern technology through what is known as eSports. ESports, as discussed in lecture, are rapidly gaining in popularity, and relate to many aspects of the course spanning from the definition of play, to the transformation of sports as well as the portrayal of athletes in media. This past semester I attended two events in which incapsulated the theme of this semester at the University of Michigan: “Sport and the University”. As a Sport Management major, I have gained a keen eye for the industry of sport, and the topics of discussion at the events that have been put on by the university have all caught my eye as “go to” events. While I have been to many, I decided to write upon one of the events I attended this past semester: the Michigan Sports Business Conference. On October 24th, 2014, hundreds of business sport oriented students from various universities flocked to the Ross Business School to take in a day filled with presentations, interactive learning, and networking opportunities from some of sports largest industry players. Among many others: ESPN Commentator and Ann Arbor resident Mike Tirico came to be a moderator of the first speech with Chief Operating Officer John Collins of the NHL, B1G Commissioner Jim Delany, and my personal favorite former Chief Marketing Officer of Vitamin Water and entrepreneur Rohan Oza. All these speakers carried a common theme throughout: that Learning and growth in any industry, specifically sport, results from the relationships and experiences developed over the course of your life leading to a well-rounded thought process about the world. Where Is an Athlete’s Place in Politics? Over the last several months, the case of Michael Brown being shot by a police officer in Ferguson, Missouri, has become probably the most controversial issue in the country currently. After Officer Darren Wilson was not indicted by the Grand Jury, several movements- some peaceful, some not so much– have broken out all across the country. A few days ago, I was one of the thousands of fans present at the Chrisler Arena to cheer on our basketball team versus the Syracuse Orange. In dramatic fashion, including a late three-pointer by Spike Albrecht, the Wolverines pulled off a thrilling victory. The fan base erupted; in fact it was energetic all night. For example, a friend of mine got to the game around 3 o’clock to be admitted into the “Maize Rage,” a die-hard student fan base solely for the basketball team. Each fan comes decked out in maize, and is prepared to jump and cheer throughout the entire game in support of the team. I can contest to this energy being contagious, as the Maize Rage starts cheers that spread throughout the arena. The Maize Rage, Michigan’s basketball team’s die hard student section, supports the team with constant energy. This same energy, unfortunately, was not nearly as present during a Michigan girl’s gymnastics meet later in the week. The talent between the basketball players and gymnasts is equally as impressive, but the Chrysler Arena was not comparably as excited or crowded. These unfortunate gender differences in sports are discussed in detail in Mika Lavaque-Manty’s “The Playing Fields of Eton.” Lavaque-Manty believes that “no women’s sport is what universities call a “revenue” sport—that is, a sport so popular that its paying spectators make it a major business” (132). Basketball season tickets are competitive and expensive, whereas the gymnastics admission was free. While these differences in the sporting atmosphere are unfortunate, they are existent and frankly understandable. I’m the first to admit that I would rather attend a competitive basketball game rather than a gymnastics meet, and I think that is for several reasons that have been engrained in our society. Recently, while I should have been writing papers, I watched a documentary on the late 80’s/early 90’s Pistons team, nicknamed “The Bad Boys.” I’ve lived in Michigan my whole l ife and am an avid watcher of basketball, so I was glued to my laptop the whole time. The beginning of the documentary described the strength of the entire team, employing superstar players led by growing legend Isiah Thomas. The team succeeded accordingly; they won back-to-back championships in 1989 and 1990, defeating top players like Larry Bird, Michael Jordan and Magic Johnson. The team brought success back to Detroit, and gave the city something to be proud of in contrast to its decline in earlier decades. Since the fatal shooting of Michael Brown this summer, many people have explained their outrage via social media. Recently, when the grand jury decision was announced social media became the main way for people to express their opinions, and share what was happening with riots and protests nationally. In fact, I remember sitting in a movie theater and getting a CNN notification that Darren Wilson, the police office, would not be indicted. Immediately, I opened twitter to see #Ferguson all over my feed. Specifically, I noticed many celebrities tweeting and sharing photos on Instagram about the news. I scrolled through posts from Beyonce, The Kardashians, and many actors. But one athlete really caught my eye. 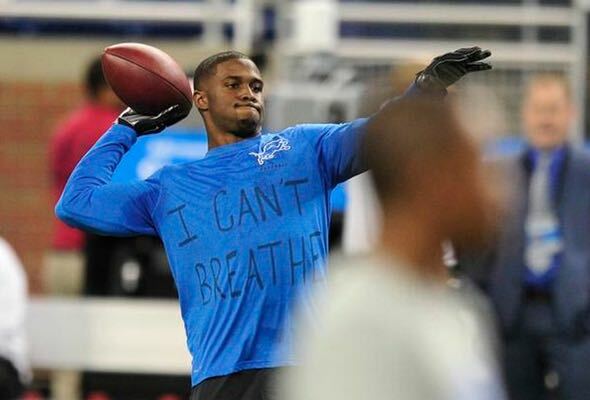 Reggie Bush, the Detroit Lion’s running back, posted multiple tweets about the incident. One said, “I guess we shouldn’t be surprised anymore when stuff like this happens! ‪#JusticeForMikeBrown”. I remember looking through responses and seeing how his fans supported his thoughts on the disheartening situation in Ferguson. When discussing “Where Are The Jocks for Justice” in section, we talked about how athletes are often scrutinized for speaking up about political issues. In the article, Candaele and Dreier mention how many athletes visit hospitals or do other charity work, but speaking up about more extreme issues is rare because they are “expect to preform not pontificate”. In class I asked John why athletes can not get away with this right as easily as musicians or actors. His answer was that artists do not usually represent a specific community or crowd the way athletes do, and that athletes also may worry about endorsements. This response made me realize the pressures that athletes face from the organizations they are associated with and how unfair this is. Athletes should be able to speak their mind on most political issues the same way other people of high stature do. Many people look up to athletes and by them taking a stand others may feel inclined to do so as well. This week Bush also wore a shirt that said, “I can’t Breath” to warm up for a game to show his support for the unjust death of Eric Garner. In the case of Ferguson, Reggie Bush, was not the only athlete to speak up. Much more famous athletes like, Lebron James, Magic Johnson, Kobe Bryant, and Serena Williams all also tweeted. I think it is admirable that these successful athletes, who I am sure are all endorsed by major corporations, spoke up about this issue of race and human rights. They should not be ridiculed for defending an issue that they care about, especially since it does not affect their performance in the sport they play. Interestingly, I could not find any information on people being offended by these athletes sharing their opinion. This makes me believe that because of social media our culture may be changing to allow athletes to have political views. Since personal social media accounts are an easy way to constantly express oneself, athletes may be becoming more comfortable with pushing the boundaries and sharing their personal views.